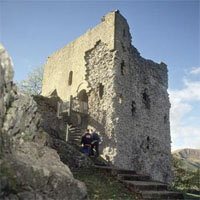 Perched high above the pretty village of Castleton, the castle offers breathtaking views of the Peak District. Founded soon after the Norman Conquest of 1066 by William Peverel, one of King William's most trusted knights, it played an important role in guarding the Peak Forest area. When 'Castle Peak' (as it was known in the Middle Ages) passed into the hands of Henry II, he made a number of additions. Most notable is the great square keep, with its round-headed windows, built in 1176. Thirteenth-century developments included the great hall, and though by 1400 the fortress had ceased to be of strategic importance, its impregnability guaranteed its continued use as a prison. Following extensive conservation work on the keep, English Heritage has erected a walk-way at first floor level, enabling visitors to enter two chambers previously inaccessible: a medieval garderobe, and a small room with beautiful views of the surrounding countryside.